WHO WON HEAT 2? See my post here. 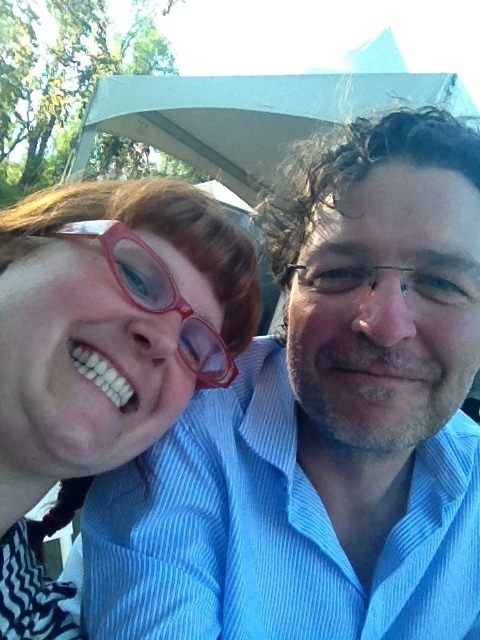 Iron Chef Eugene is one of my favorite events, as longtime readers of this blog know. I’ve had the privilege of serving as judge and/or emcee multiple times in its short, sweet history. 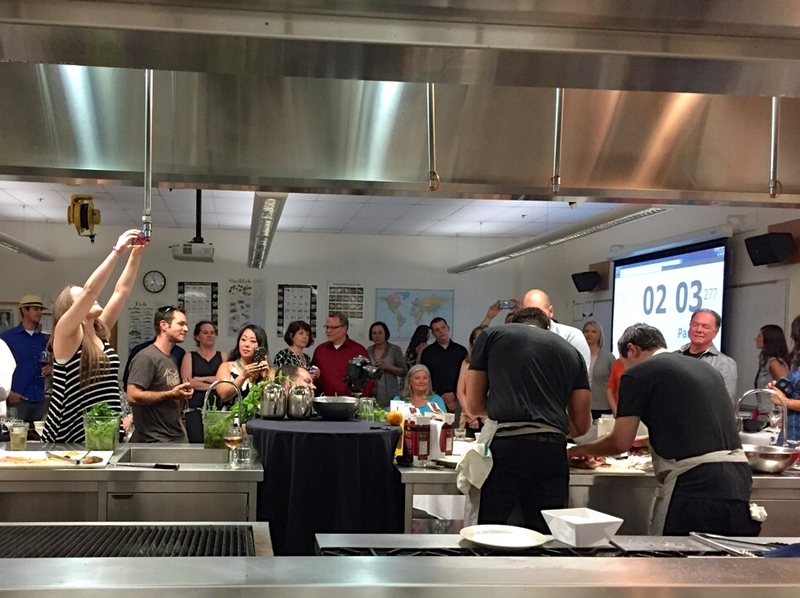 Our best chefs get to play with dishes and engage in friendly competition with their colleagues, and the winner gets to go on to Portland for Iron Chef PDX. It’s like our locavore version of a sport state finals. We’ve done very well at the state level in the past, in fact, with Chefs Gabriel Gil and Jeff Strom coming home victorious (Jeff twice!). This year, the competition has shifted management into the able hands of Prof. Lisa Benson Aherin and her team in the hospitality and culinary schools at Lane Community College. She and her right-hand woman, Shelly Kane of Moxie Events, have created a dining extravaganza for guests and judges alike. Another cool thing about this year’s Iron Chef Eugene is that it is done in three heats on three different days. The first heat already happened. Read on and you will see what’s to come. I’ll be judging Heat 2, coming up on Tuesday, June 16, alongside Chefs Karl Zenk of Marché and Heidi Tunnell of Heidi Tunnell Catering, who won Iron Chef Eugene a few years ago but couldn’t compete in Iron Chef PDX because she was NINE MONTHS PREGNANT at the time (she totally would have smashed the competition otherwise). For $75, guests will enjoy a multi-course meal prepared and served by LCC culinary students and paired with some of the best wines in Eugene from William Rose Wines. The winemaker, Mark Nicholl, also of Oregon Wine Lab, and the inimitable Chef Clive of LCC will emcee the competition for your entertainment and edification. Proceeds help support the LCC culinary program. If you’re interested in signing up for a seat at Heat 2 (or the final), don’t hesitate. Tickets are going fast! Each heat is ticketed separately. Due to the nature of the event, dietary restrictions cannot be accommodated. For tickets, please click this link. If you have any questions, please click this link and ask the organizers on the event page. Comments on this blog may not be seen by organizers. May 31 – 1st Heat. Guests enjoyed a four-course meal paired with wine from Oregon Wine Lab, prepared by students from Lane’s Culinary program along side of Chef Adam and Chef Tim Hill. 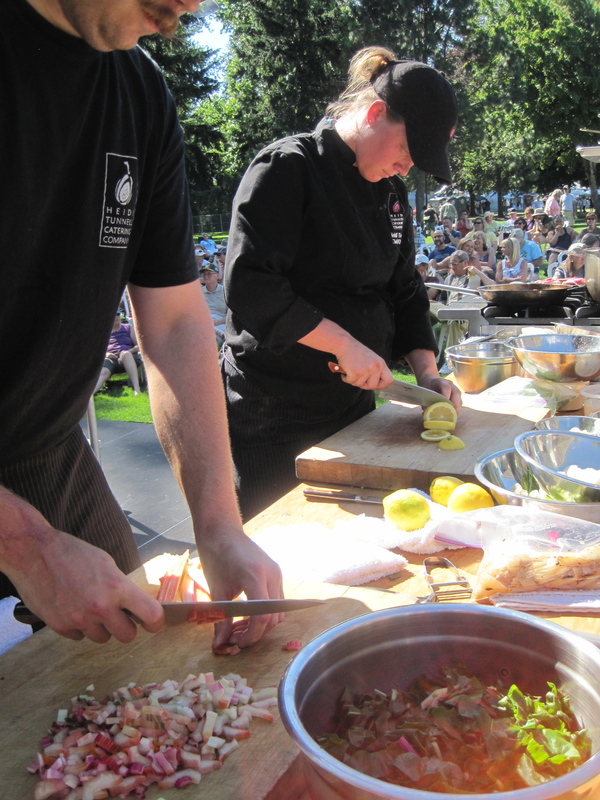 Chefs Mikey & Brendan from Belly and Taro & Patrick from Mame competed in an OREGON LAMB BATTLE, and Belly reigned supreme! Mikey and Brendan will go on to the final. June 16 – 2nd Heat. Guests will enjoy a four-course meal, prepared by students from Lane’s Culinary program along side of Chef Adam and Chef Tim Hill, paired with wine from Oregon Wine Lab, while they watch Chefs Mark & Tiffany from Party Downtown vs. Ryk & Dunkin from WildCraft Cider Works. July 6 – Final. Chefs Mikey and Brendan of Belly will battle the winner of Heat 2. Guests will enjoy a four-course meal prepared by students from Lane’s Culinary program alongside a celebrity, Iron Chef Oregon winner Jeff Strom of Koho Bistro! 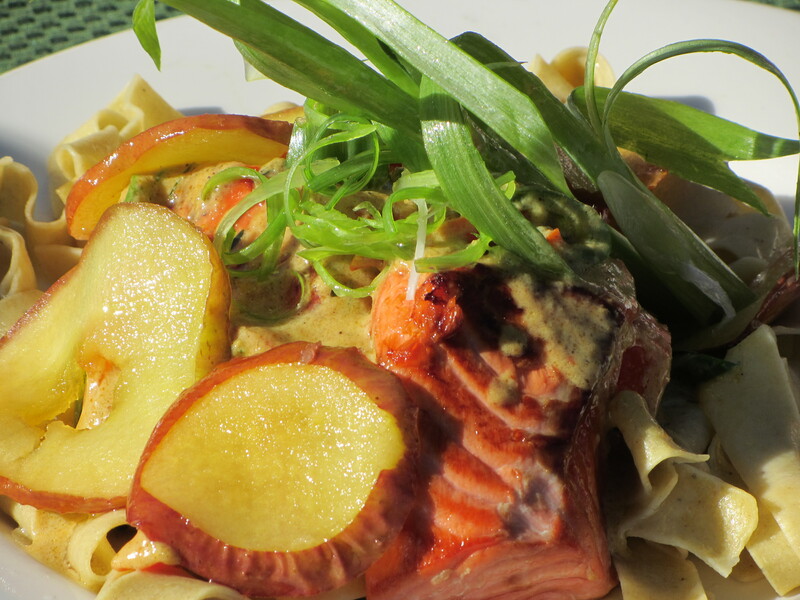 The meals will be paired with wines from Oregon Wine Lab. iron chef eugene 2013 is chef brad burnheimer! 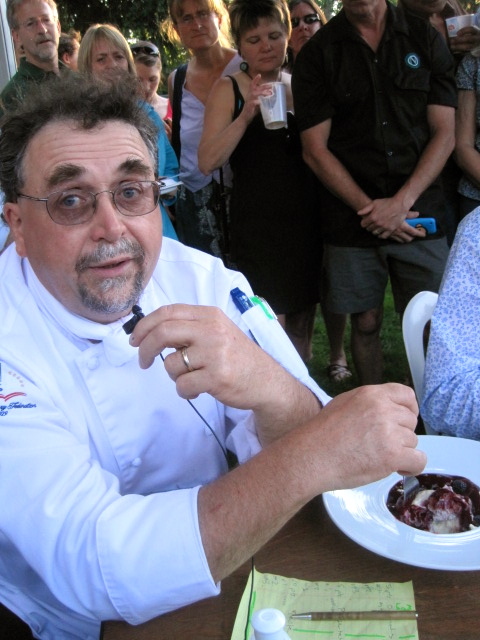 UPDATE 8/9: Iron Chef Eugene Brad Burnheimer had an unavoidable catering commitment, so Chef Mandra will be filling in at Iron Chef Oregon this weekend. If you’re in Portland, go and cheer on our two Eugene competitors, Mandra and Iron Chef Oregon 2012, Jeff Strom of Koho Bistro, who will be defending his title! Yesterday was a beautiful day at the Bite of Eugene. We sampled all manner of goodies from local chefs, drank Kore Kombucha, wine from William Rose and Kandarian Cellars, and beers from Agrarian Ales and Claim 52. Take a look at my full photo set on Facebook. Most of all, we enjoyed the passionate battle for Iron Chef Eugene 2013 with competitors Chef Brad Burnheimer of Agrarian Ales/Burnheimer Meat Co., Chef Max Schwartz of The Old Pad, and Chef Nengah I Mandra of Lucky Noodle/Ring of Fire. The competition had some setbacks, after Chef Brendan Mahaney from Belly fell ill, so he and Taco Belly Chef Justin Trent needed to bow out of the contest at the last minute. 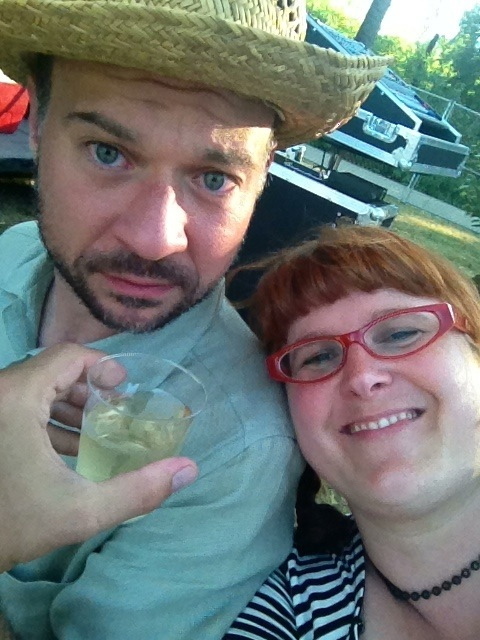 Luckily, Festival Organizer Steve Olivier was able to have a wonderful chef fill in, long-time Ring of Fire Executive Chef Mandra, who performed as a true pro would — without prep, a sous chef, his own ingredients or tools, and on the spur of the moment. I was extremely impressed. When are you going to open up your own place, chef? It was nice to see my Iron Chef pals Jeff Kandarian and Joel Pomerantz, judges for the first round, and meet the rep for the festival sponsor, American Family Insurance, Jonathan Nixon, who served as the remaining judge for Round 1. I judged the finals with my radio show co-hosts, Boris Wiedenfeld and Ryan Stotz, and Lance Sparks handled the emcee gig with a little help from his wife, Artie Lieder, Steve Olivier, and the judges of the final round. It takes a village! Many thanks are due to William Rose winemaker Mark Nicholl, who ceded his Round 2 judging duties and instead provided us with a couple of bottles of his wonderful Riesling (I think he must have heard me talking about it on the blog!) 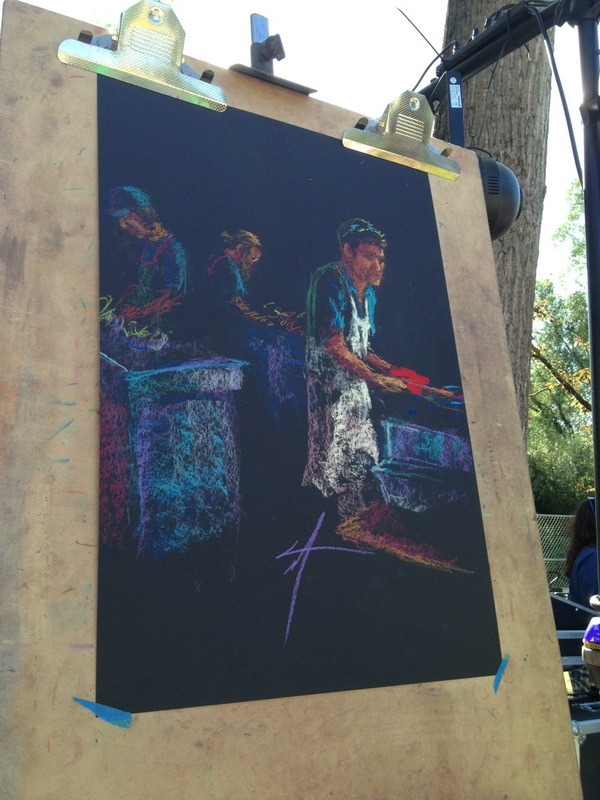 to enjoy with the finals dishes, and chalk artist Lester Mayer, who sketched the competitors. 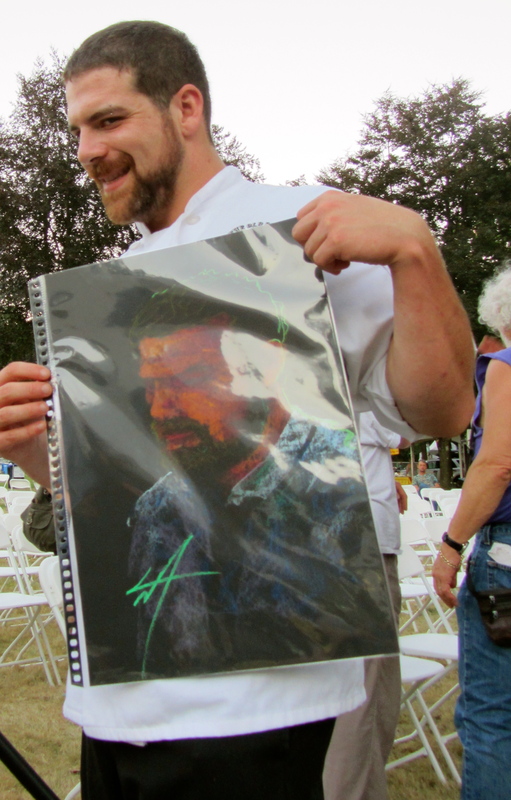 His work was auctioned off to audience members and presented as a thank you to Chef Max Schwartz, who has competed in Iron Chef for four years running, each time with a narrow miss for victory. After some unusual and lovely dishes for Battle Chinook Salmon and Battle Hazelnuts, including a gorgeous squash blossom stuffed with salmon saltimbocca and a chicken ballantine with hazelnut herb stuffing and hazelnut romesco by Chef Burnheimer; a salmon noodle curry with sauteed apples by Chef Mandra; and a surprising hazelnut flan with a nugget of chocolate-hazelnut spread inside by Chef Schwartz, we decided to crown Chef Burnheimer Iron Chef Eugene 2013. May he reign supreme at Iron Chef Oregon! And one more shout of huge appreciation to Steve Olivier, who has put on this festival for five years, often just breaking even, and the volunteers and vendors who make it a wonderful experience for all. Sure, it’s for a great cause and the sponsors donate money to a range of food non-profits, but what matters most to me is the labor and effort we all extend to make our community better when we get together at these venues. This is why I’m so proud to participate and would encourage more Eugeniuses to make the effort to attend and appreciate the folks who grow and make your meals. For every weirdo who takes food from the Iron Chef judging table as the chefs are still making their deliberations (yes!! ), there are 10 stories of a successful restaurateur giving advice to an up-and-comer about new city funding initiatives for business development, a sous chef impressing his boss with the popularity of a new recipe, farm secrets shared and giggled over, recipes debated, and new directions open to exploration. iron chef at the bite of eugene 2013: allez cuisine! Yes, it’s that time! My favorite local competition at my favorite local festival: the Iron Chef Eugene competition at the 5th Annual Bite of Eugene. What’s the Bite of Eugene? 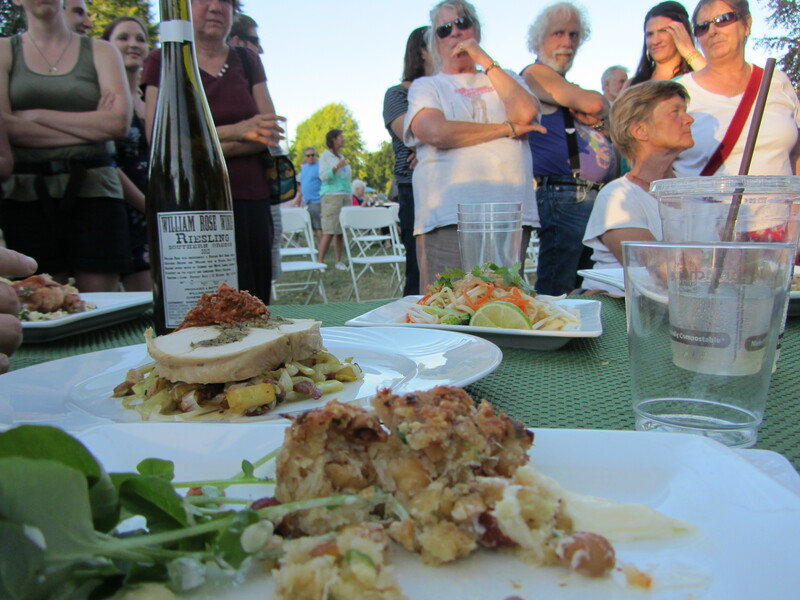 Let the organizers tell you: “The 5th annual American Family Insurance Bite of Eugene is a celebration of our local food scene and culinary culture with a focus on sustainability. This year’s event will be held on July 20th from 11am-10pm at Alton Baker Park in Eugene. Admission is $5 for adults, children 12 & under are free. Food and beverages at the event will be priced and sold by the various participating local vendors. Food booths will be offering “bites” of their locally created provisions. Local beer and wine will also be offered along with non-alcoholic beverages. 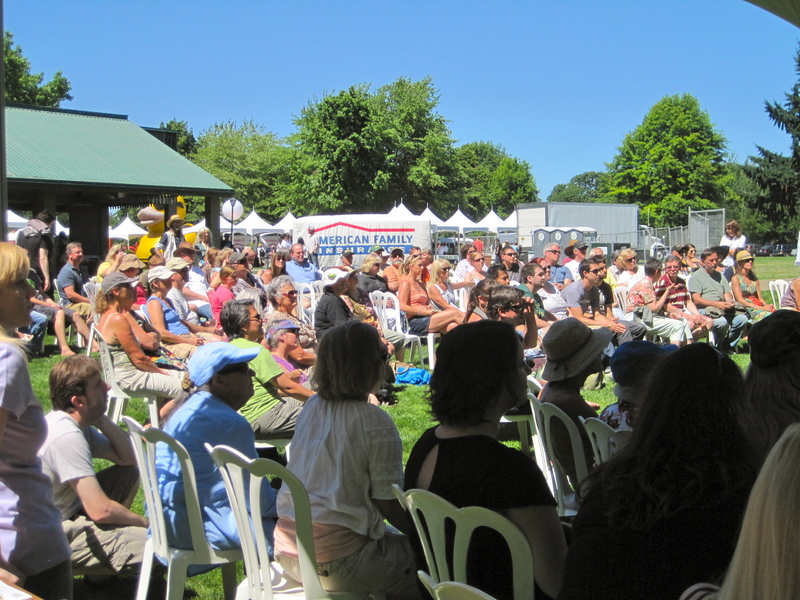 A wide array of entertainment is also available, including cooking classes, foodie seminars, local music, family/children’s area, and a live local Iron Chef competition.” See the full schedule of entertainers and other details here. 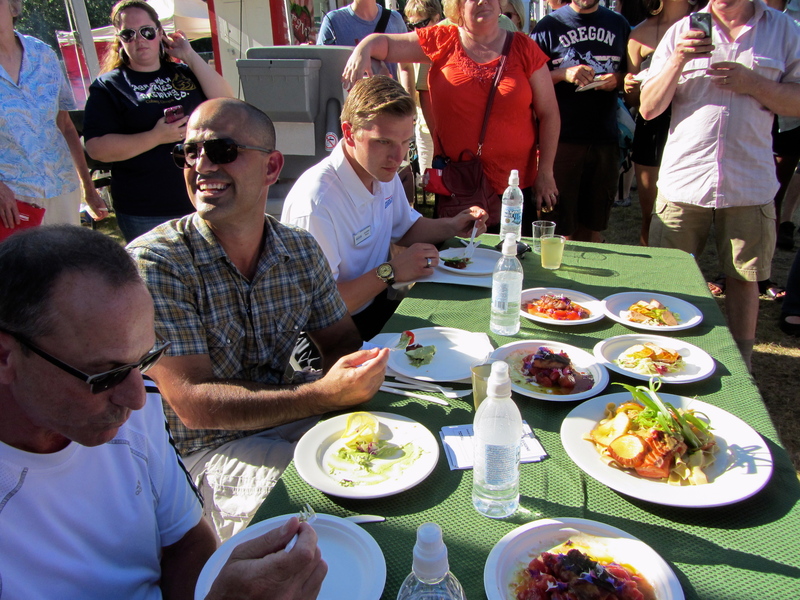 Judges: Jeff Kandarian (Kandarian Cellars), Joel Pomerantz (OR Restaurant & Lodging Assoc.) and Ray Walsh (Capitello Winery). Judges: Mark Nicholl (William Rose Wines), Clive Wanstall (LCC), and Artie Lieder (Restaurant Consultant). Judges: KLCC’s Food for Thought’s Boris Wiedenfeld, Ryan Stotz, and Jennifer Burns Bright, aka Levin, aka Culinaria Eugenius, aka yours truly! Any local foodies will also be interested in the fantastic cooking seminars, featuring local talent and some of our best chefs, wildcrafters, fermenters, activists, and more. 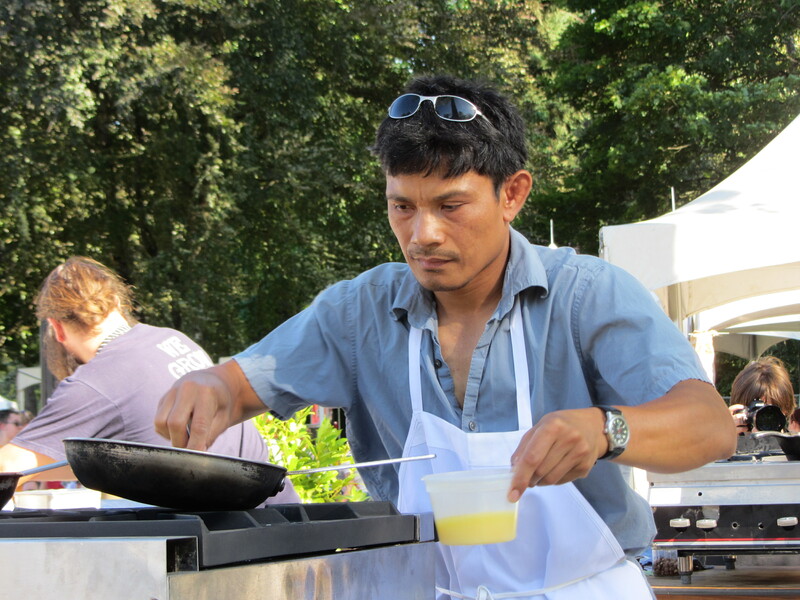 The headlining cooking classes will feature two past Iron Chef Eugene (and Oregon) winners. See you there; can’t wait! iron chef eugene 2012: chef jeff strom of koho bistro! 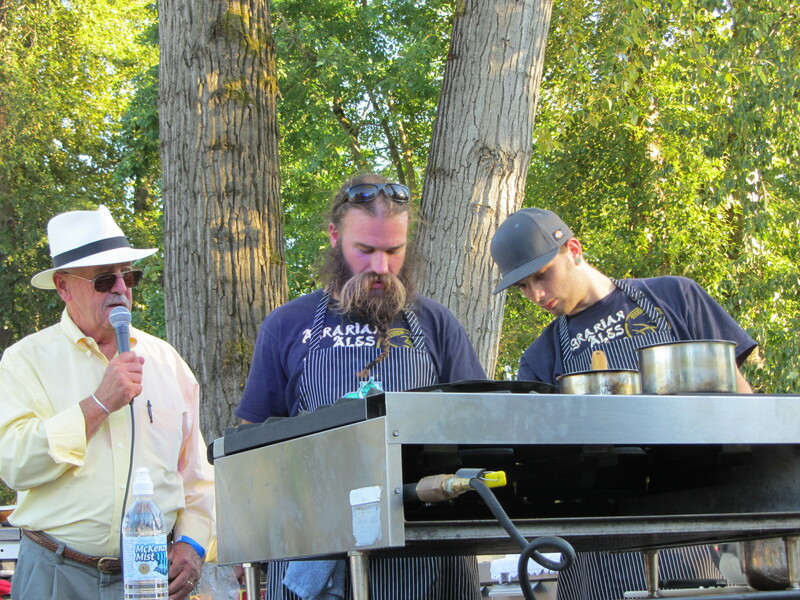 Last night at the Bite of Eugene festival, four stalwart souls faced off in the annual Iron Chef Eugene competition. The dishes were tasted and the results were tallied by judges including our very own Boris Wiedenfeld (above, at last year’s competition). After heated battles in which Anthony Parshall of Lewis & Clark Catering bested Codi Lapoint of Falling Sky Brewing, and Jeff Strom of Koho Bistro emerged victorious against Jen McElroy of Wild Duck Cafe, we have a new champion. Chef Jeff Strom reigns supreme as Iron Chef Eugene 2012! Visit the restaurant (Koho Bistro’s website) tonight to extend your congratulations, and listen in to our interview with Chef Jeff on Food for Thought on KLCC (89.7FM) on Sunday at noon. We’ll hear more about the competition, secret ingredient, and how the battles were won. UPDATE: Listen to the show archive here. Also on the show, we’ll be interviewing David Gremmels, co-owner, president, and cheesemaker extraordinaire at one of Oregon’s delights, Rogue Creamery! They’re in the middle of making the award-winning Rogue River blue cheese, released once a year in its signature pear brandy-macerated grape leaf wrap. We’ll hear about the process and other important developments in the cheese world. We’ll also hear the latest in garden developments and how the summer produce crops are doing this year from our friend and frequent contributor Ross Penhallegon of OSU Extension in Lane County. It should be a great show. Don’t miss it! Listen to KLCC on the radio in Eugene, one of our many sister stations in Oregon, or live on the internet! 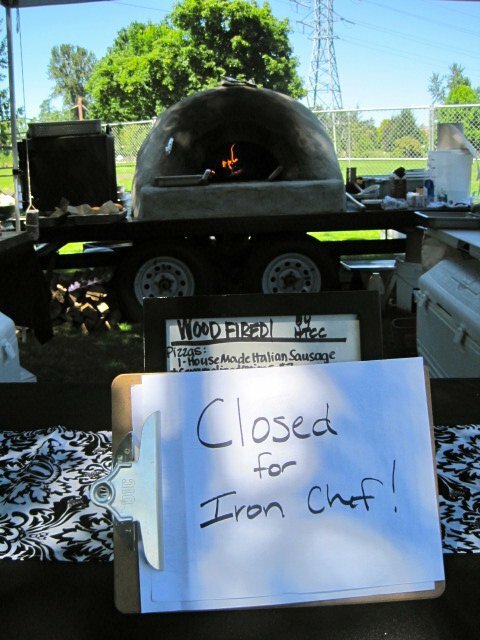 breaking news for bite of eugene’s iron chef 2012! 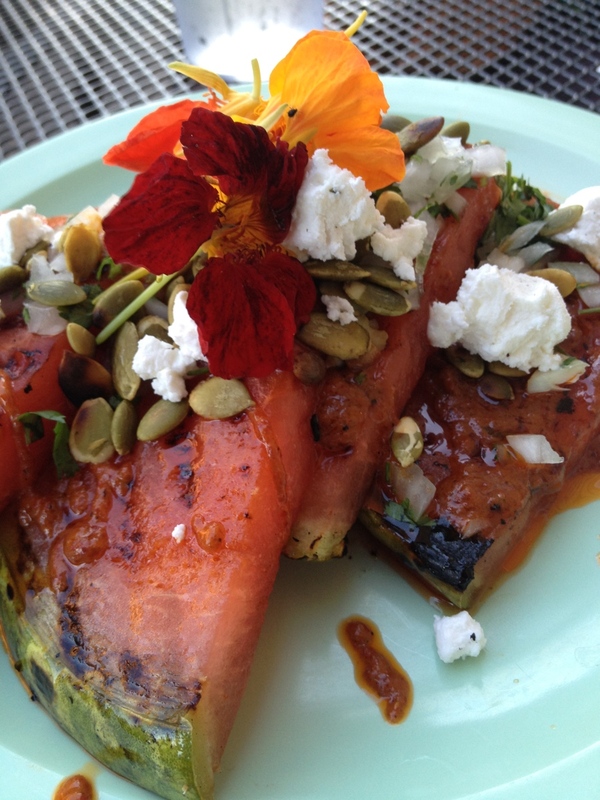 Updated: Congratulations to Chef Jeff Strom of Koho Bistro, Iron Chef Eugene 2012! 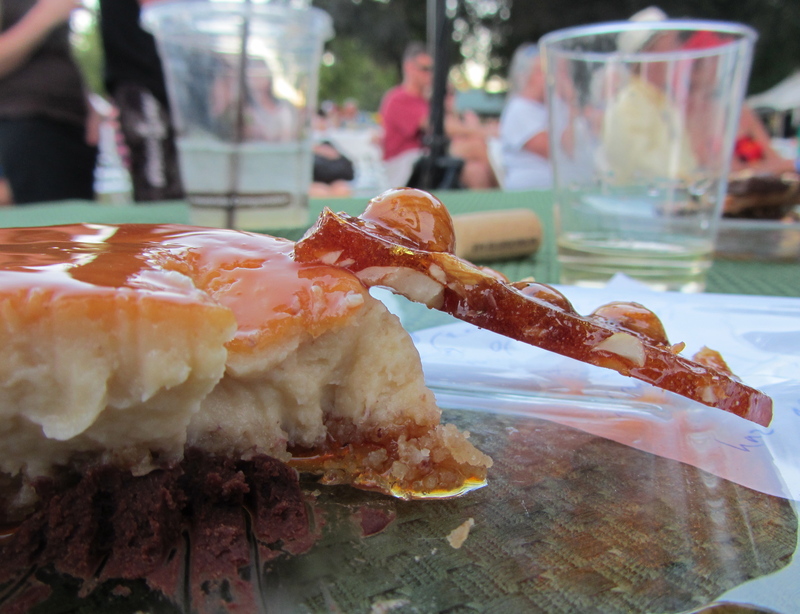 Don’t forget about the Bite of Eugene festival, tomorrow, Friday, July 20, from 3-10 p.m. The Iron Chef competition will feature battles among four local restaurants: Chef Codi Lapoint of Falling Sky Brewery and Chef Anthony Parshall of Lewis & Clark Catering will face Chef Adam Peterson of Wild Duck Café and Chef Jeff Strom of Koho Bistro. (Edited to add: Previous reports that Chef Mike Meyer of Red Agave was a competitor were mistaken.) Celebrity guest judges will include Boris Wiedenfeld, Lance Sparks, and last year’s Iron Chef Eugene, Chef Heidi Tunnell. To give you a taste of what’s to come, check out some of the dishes in the championship battle of 2011! And keep in mind that the action extends to sampling other eatery “bites” from local venues like Café 440, Cornbread Cafe, Davis Restaurant, Delacata, Excelsior, Falling Sky, Rabbit Bistro & Bar, and Wild Duck Café, Coconut Bliss, Divine Cupcake, and co-sponsor Lochmead Dairy. (if I missed anyone, let me know!) 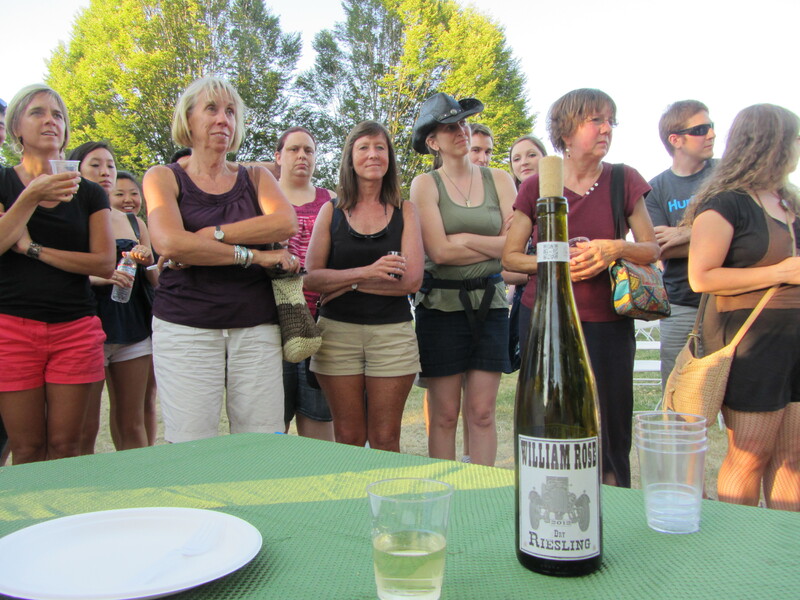 A $5 suggested donation will support the Willamette Farm and Food Coalition. There will be plenty of bike parking, music, and an area for the kids. ****BREAKING NEWS**** Nicole Peltz of Field to Table Catering will be subbing for Heidi Tunnell at the Iron Chef Oregon competition today in Portland. We wish her all the best of luck and Heidi a speedy recovery! The Bite of Oregon and the Iron Chef Oregon competition is here! 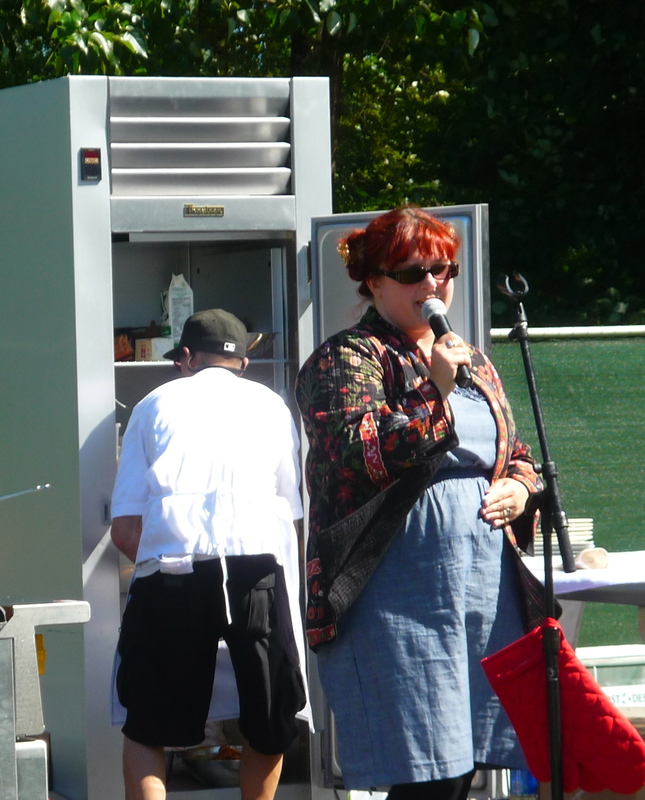 Starting this evening in Portland’s Waterfront Park, Iron Chef Eugene Heidi Tunnell of Heidi Tunnell Catering will battle three chefs from elsewhere in Oregon. Allez cuisine! 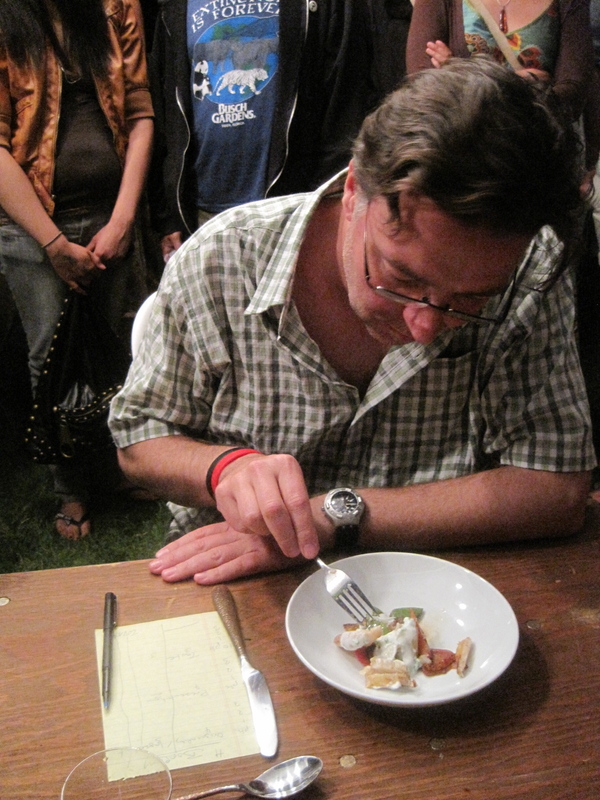 I’ve been thinking about the Iron Chef Eugene competition and what a success it was. Heidi managed to pull off her win while almost 9 months pregnant, and she had a healthy baby boy a week later (congratulations!). Even better, this year’s Bite of Eugene raised over $9,000 from our generous title sponsor, American Family Insurance, and the matching donations from our community for Willamette Farm and Food Coalition. And another $1,000 or so in tips that the festival donated to the Eugene Rotary, whose volunteers helped serve the crowd. I don’t think I need to say how profoundly your donations will impact WFFC’s efforts to improve sustainability and local food awareness, but I will. Thank you so much. 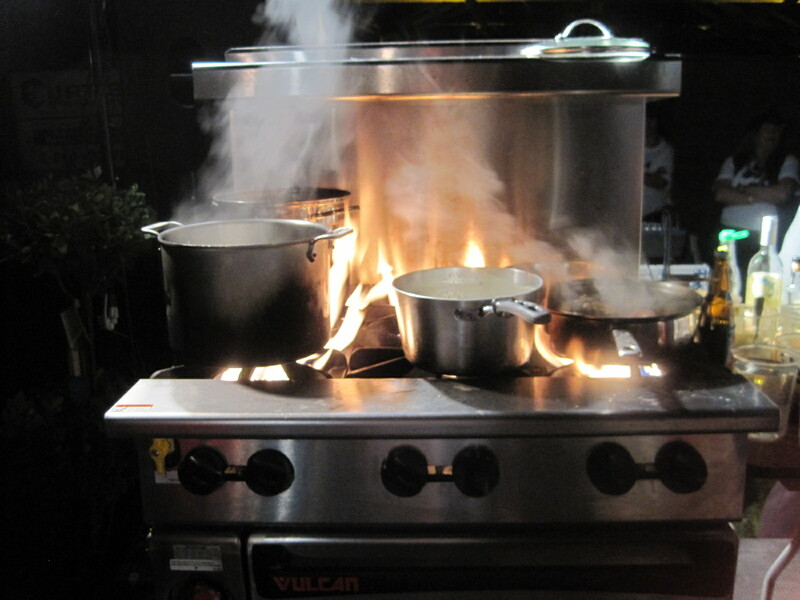 The competition didn’t go off without a hitch — we had problems again with the gas line for the stoves. We called this one The Inferno. It was less a problem with the stove itself than the hookup, I think. 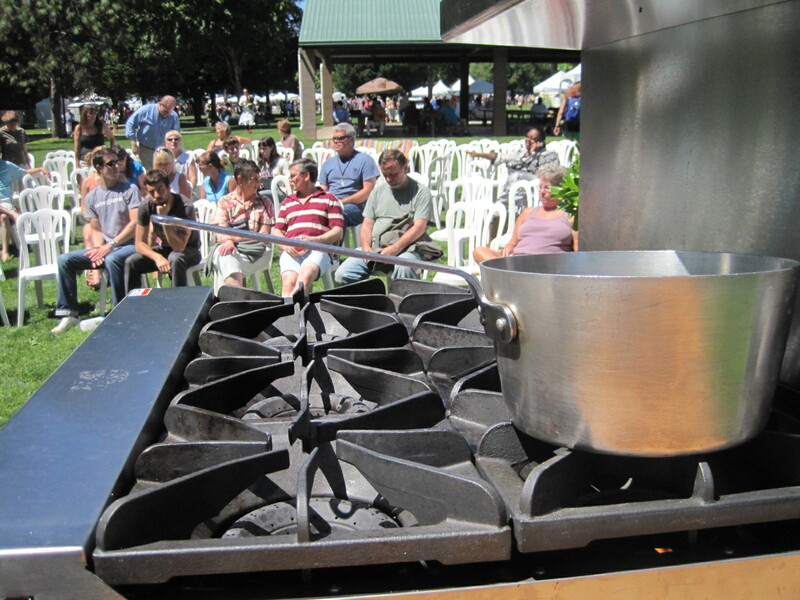 I wonder if we might solicit a donation of on-site labor for an equipment tech crew from the stove folks next year? It would be much appreciated and would enable us to stay on schedule. 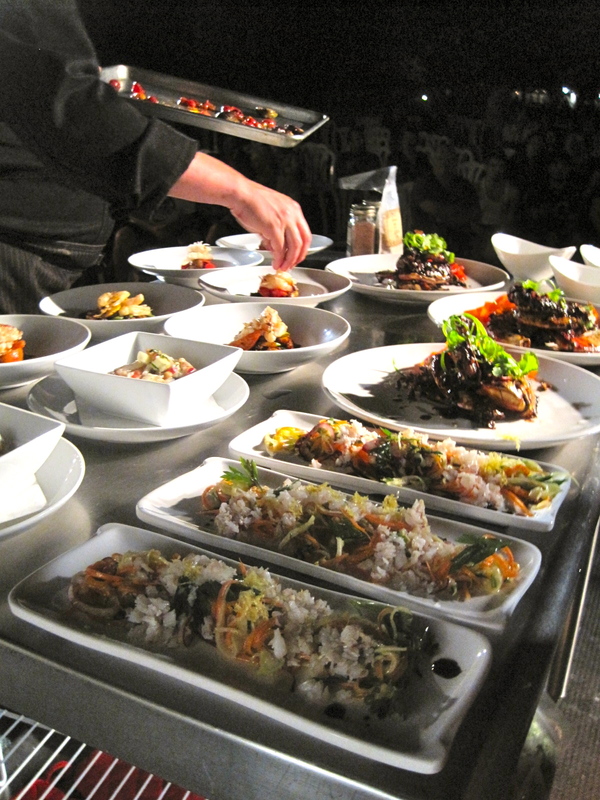 By the time the day was over, the final competition round dishes were served in a spotlit stage. 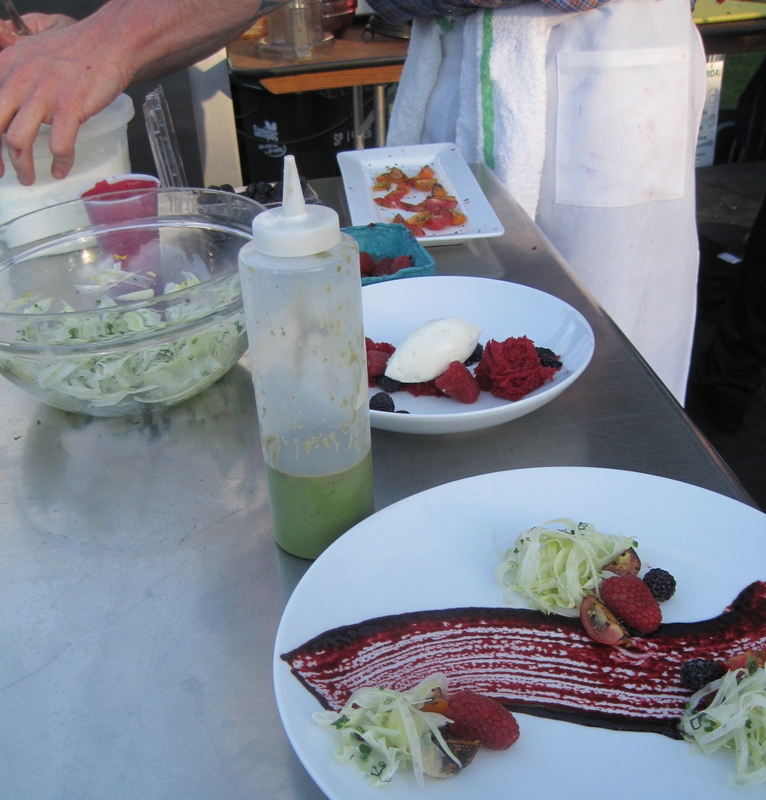 This is the final plating just prior to the finish of the competition. 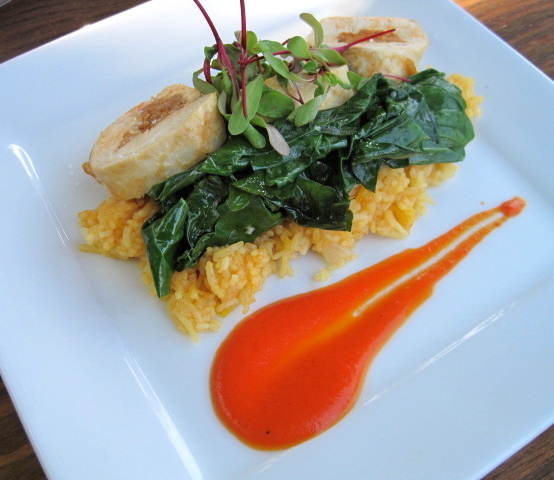 I’ve already mentioned my favorite dish of the competition, Mike Meyer of Red Agave’s interpretation of arroz con pollo that featured caul fat-wrapped, chorizo-stuffed chicken breast and saffron rice with greens (puh-lease add the chorizo to the arroz on the menu at RA!!!! I know it’s a crowd pleaser dish as is, but OMG it was so good and the chorizo gave the whole thing a boost of spice and juiciness). But there are others that linger for me. 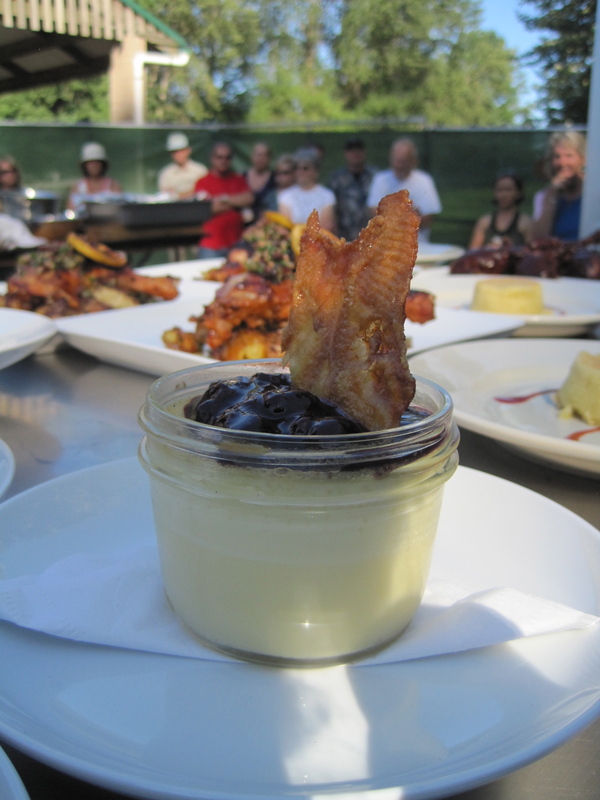 I can’t stop thinking about Heidi’s simple pot de crème with a caramelized chicken cracklin’. 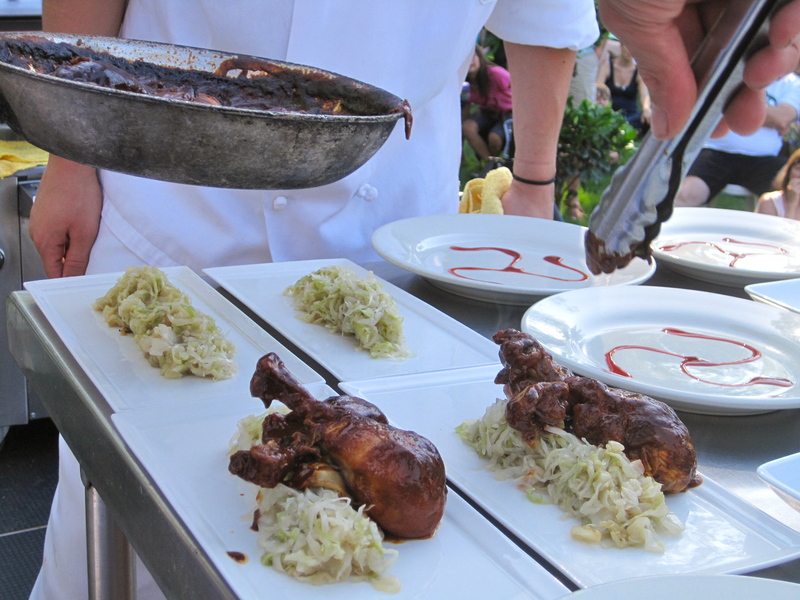 Mike’s chicken drumsticks over a warm bourbon slaw, too, was inspirational — literally. I ended up making a warm Riesling slaw for a party a week later, based on that idea of a boozy warm cabbage. Yum. Heidi’s chicken under a brick, a traditional Italian preparation, served over fried cauliflower, potatoes, and garnished with roasted lemon, looked homey and delicious and won raves from judges. A bigger triumph was her ingenuity in shipping it off to her own brick oven at the vendor area of the festival when our ovens stopped working. 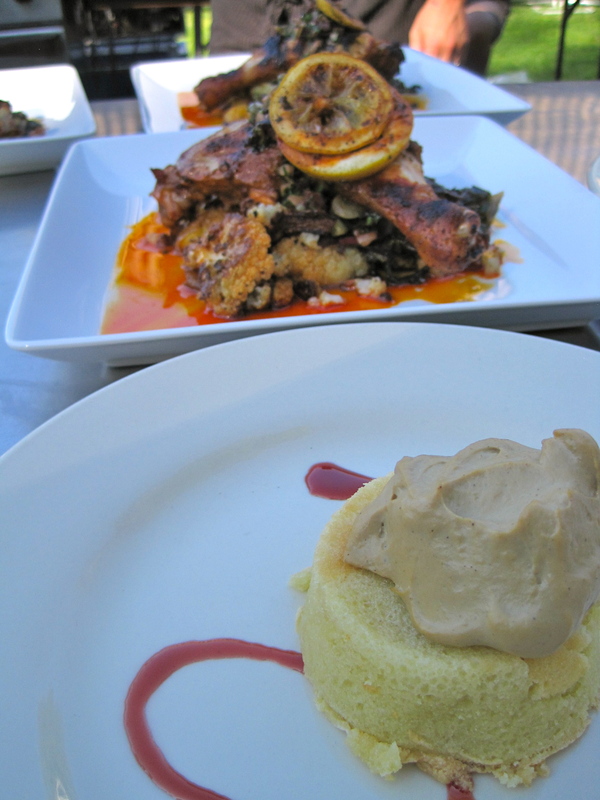 Here it is with Mike’s almond cake with chicken liver mousse, a pairing that would have worked a tad better had there not been so much mousse. A bit more unusual was Shane Tracey of Nib Modern Eatery’s seared scallop pillowed in a bowl of blackcap raspberry foam (with judge Clive Wanstall, below). Shane raised the bar in the competition for molecular gastronomical experimentation, to mixed reviews. I found the dishes quite easy on the eyes and was happy he was there to showcase some of the latest techniques in making sauces and rather intriguing spongy cakes. And no matter what the judges said, I was all for the black raspberry swath on the plate. Chef Max Schwartz also held his own in the competition. He was the most junior member of the competition, a new sous chef at the new Agate Alley Laboratory, which has some eyebrow-raising items on the menu. 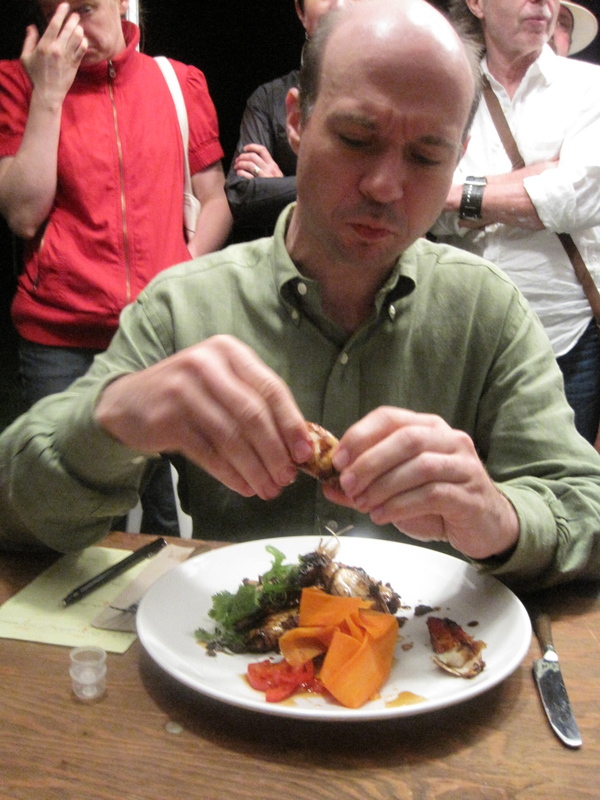 He was the only chef to tackle an Asian dish — fermented black beans braised dungeness crabs eaten by Boris, last photo. I was most pleasantly surprised by the lavender-tinted scallop ceviche that he turned out, replete with a sour curing juice with lime and blackcaps. 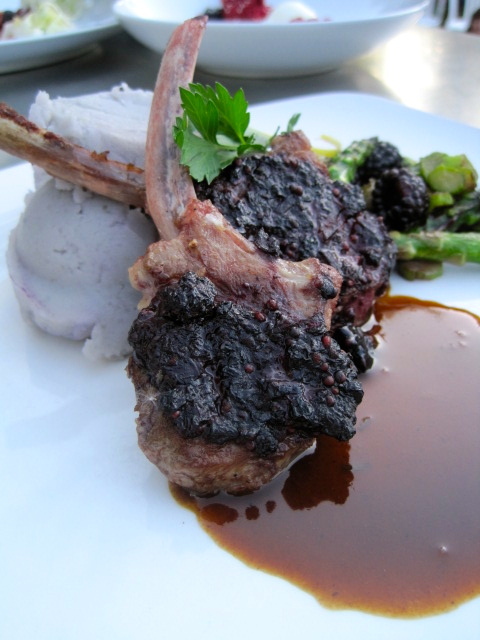 No picture, sorry, but these lamb chops with a raspberry sauce and meaty reduction with blue potatoes had panache. Thanks to all the wonderful chefs and their good humor and willingness to take criticism and perform in front of a live audience in the spirit of sharing good food and raising money for our local foodshed. I wanted to thank the judges, too, for their honesty and banter. I’ll admit I was pretty jealous that I didn’t get to hang out and eat with them, but I’m not sure if I could have kept up with the demolition crew. I’m not sure I’ve ever seen food disappear so quickly. Plus, if I had been a judge again, I wouldn’t have been able to rock my Chairman Kaga jacket (can you believe that I didn’t arrange for a photo of me biting into the pepper? WTF?). But still. If you’d like to see more photos, go here. If you’d like to read more about the competition, go here for the Register-Guard story or here for a link to the KLCC “Food For Thought” interview with me and Heidi, hosted by judges Boris (top) and Ryan (bottom) (photos, not confirmed orientations). Thanks go most of all to the event organizer, Steve Olivier, who wanted me to emcee and make mah own Iron Chef dream come true.